In An exploratory journey across ‘the roof of the world’, which allows you to admire the picturesque Lhasa, legendry monasteries and fortress of Gyantse and Shigatse on a best 4WD Land Cruiser escorted by a team of local high altitude camping crew and expert local Tibetan & Nepali guides. A thorough exploration of ruins of ancient mystical Guge Kingdom in the remotest western Tibet, an arduous trek around Mt. Kailash crossing Drolma La at 5630meter, encounters with Tibetan Nomads and the views of snowy peaks are the major components of the trip. On this trip, we fly from Kathmandu to Lhasa and spend 3 days visiting the wonderful sights of this fascinating city. Leaving Lhasa we further explore the ancient towns of Gyantse and Shigatse. Driving along the northen highway through the hypnotic landcape of the Tibetan Plateau brings us to the ruins of Guge. After detailed visit of Guge Kingdom (Toling and Tsaparang) we continue our journey to Lake Manasarovar and Mt. Kailash where we complete a three day kora (trek) around this beautiful mountain. We then drive across vast Tibetan plateau before heading south to the Nepalese border and returning to Kathmandu. Morning transfer to the airport for an hour-long flight to Tibet. This spectacular flight, on an Air China, takes us right across the main Himalayan range and provides us with magnificent mountain views. After landing at Gonggar Airport and meeting our Tibetan guide, it is a further 2 hours drive by Land cruiser jeep to Lhasa where we will check into the Hotel. Today will be spent visiting several of Lhasa's many monasteries in the company of guide and interpreter. One of these is the Sera Monastery, one of the best-preserved monasteries in Tibet. Within it's white – washed walls and golden roofs, several hundred monks live and study. After lunch we'll visit the Norbulingka, the summer palace of the Dalai Lama, as well as the Jokhang Temple. This temple is possibly the most sacred shrine in Tibet and there is always a procession of devout Tibetans through the complex. Surrounding the Jokhang is the Barkor – a maze of narrow cobbled streets which is the central market of Lhasa. A visit to the Drepung Monastry this afternoon will complete a truly awe – inspiring day. Founded in the 14th century, this monastery was once the largest in the world with a population of around 10,000 monks. These days that figure is down to several hundred, but there is still much here of interest as it was left relatively unscathed during the Cultural Revolution. Today we start our overland journey towards Mt. Kailash Mansarovar. Traveling by jeep along the Friendship Highway we cross the Khamba La (4794m) from which there is stunning views across the waters of Yamdrok – tso Lake to the snowy summit of Nazin Kang Sa (7252m). We continue westwards over another high pass the Karo – La (5045m) where we treated to the spectacular sight of a huge glacier tumbling down to within a few hundred meters of the road. After passing through beautiful valleys and colorful Tibetan Villages we arrive in town of Gyantse. Before continuing to Shigatse we visit the Gyantse Dzong and Gyantse Kumbum. The Dzong is a fort dating from 14th century from which there are amazing views of both Gyantse itself and the surrounding Nyang Chu Valley. The Kumbum is a large gold – domed stupa and its many small chapels house an impressive array of Tibetan Buddhist murals. Day 5. Drive Shigatse – Lhatse (4050m) 150km. Today before leaving Shigase we explore the local market and make a detailed visit to Tashilhumpo Monastery. This monastery is one of the largest functioning monasteries in Tibet and there is much to explore within its high surrounding walls. After exploring around we continue along the friendship Highway, marveling once more at the barren yet spectacular landscape of Tibet. It is a dusty little place that lines the friendship Highway. Our overnight accommodation will be at Guesthouse. Where you will meet with our Sherpa Staff. Today we get early breakfast prepare by Nepali staff and then proceed on to Sasang via Northern route. Crossing Yarlung Tsangpo (Brahmaputra) the road emerges to a lush river valley where a small beautiful Tibetan settlement is worth visiting. Up on arrival in Sasang a small town we pitch camp for overnight halt. Day 7 Drive Sasang – Tsochen 355 km. A long but a scenic drive through grassy riverside takes us to our campsite at Tsochen. The route winds up through lush green hills backed by impressive view of snowy peaks in the distance. The road finally opens out onto a wide plain. Further 84 km drive brings us to Gertse where we camp overnight. Day 9. Drive Gertse- Gakyi 373 km. A scenic drive through a wide valley brings us at Gakyi crossing a pass route. Day 10. Drive Gakyi – Shiquanhe 112 km. Driving parallel all the way to Indus River we reach Shiquahne, a town with modern look. Day 11. Drive Shiquanhe – Tsada (Guge Kingdom) 295 km. The rough road that follows the Indus River right from the Shiquanhe takes us to a small village from where we drive up to The Guge Kingdom crossing series of passes. Today we make a detailed visit through the ruins of Guge Kingdom which was founded around tenth century and played an important role in the second transmission in Tibet, survived about 700 years and disappeared mysteriously in the 17th century. The ruins lie at a hilltop near a river, covering 180,000 square meters. Houses, cave dwellings, monasteries and stupas are distributed on the hill and surrounding area. Guge Kingdom is now famous for its murals, sculptures and stone inscriptions, which are attached with those surviving structures. Among them, murals in White Palace, Red Palace, Yamantaka Chapel, Tara Chapel and Mandala Chapel are preserved in good condition. The themes of those murals, hundreds of years old but still splendid, include mainly stories of Buddha, Sakyamuni, Songtsen Gampo, kings of Guge and their ministers. Driving 280 km on dirt road enjoying spectacular vistas bring us to Darchen, which is marked by a tall pole adorned with Prayer flags. This is the starting point for Kora, the 53km trek around the mountain. The first day of the Kailash kora (trek) entails around six hours of walking from Darchen to Dira Puk Monastery. We walk up the Lha Chu Valley through beautiful green meadows and streams with Mt. Kailash towering above us. We follow the river enters a narrow canyon with high, steep cliffs and spectacular waterfalls. Continuing up the valley, the north face of Kailash comes into view before we reach the 13th century monastery at Dira Puk. We now leave the Lha Chu Valley and enter the Drolma Chu Valley, heading up towards a high pass, the Drolma La (5630m). It's a through climb to the summit which is festooned with prayer flags but from there it is all down hill or flat to Zutrul Phuk, with views of one of the highest lakes in the world, Thukpe Dzingbu Lake, Known as the Lake of Compassion. As well as the monastery at Zutrul Phuk, there are several meditation caves and another cave containing an image of Melarepa. On the final day of the Kora we cross several streams, and follow impressive gorge. Along the way we are once again treated to magnificent views of Kailash. We then enter the Bharka plain and it's about an hour's walk through this desert like landscape to Darchen. Day 17. Drive Darchen to Holy Lake Manasarovar (4560m) 35km. Towards the Lake we drive for about 35km from Darchen. It is separated from the another lake, Rakshas Tal, by a narrow strip of land and the two Lakes are linked by a small channel, it is said to be a good sign for the Tibetan people. Up on arrival at Manasarovar we will visit the picturesque Chiu Monastery on the northwest shore of the lake, with the imposing sight of Mt. Kailash in the background. This section of our journey has some incredibly panoramic scenery. We cross the Mayun – la and several rivers. Day 19. Drive Paryang to Saga. (4699m) 255km. Today we drive 150km to the huge lake called Peiku-tso. Before leaving Saga, we cross the Yarlung Tsangpo (Brahmaputra River) on a ferry. Leaving Tingri, we cross another two high passes, the Lamlung La (5124m) and Shung La (5200m). Once more we are rewarded with magnificent views of the surrounding peaks of Shishapangma, Cho-Oyu, Menlungtse and Gauri Shankar. Day 22. Drive Zhangmu to Kathmandu (1400m) 160km. From Zhangmu, it's a short drive to the Friendship Bridge which spans the Bhote Koshi River and marks the Chinese – Nepalese boarder. We say goodbye to our Tibetan guide and driver and walk to Nepalese Immigration Control in Kodari where we will be met by our Nepalese staff. 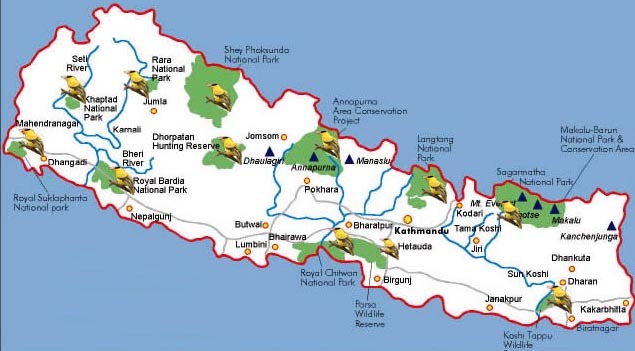 After completing the re – entry formalities we continue the drive to Kathmandu which depending on road and weather condition, should take about 5 hours. Unlike other tour operators based in Kathmandu we organize the best trips, a cut above everyone else's operation. We exclusively use the latest model 4500 Toyota Landcruiser 4wd's (USD 55000 worth vehicle), so no bouncy buses, no rickety old jeep. Airfares and Tibet visa are also included in the price. Our group size varies, the maximum is 12 people. On these regular departures you are likely to be joining a group of people from different countries. If, however, any of our dates are unsuitable for you, we can arrange a private tour for you or circulate your convenient dates and find others to join you. Moreover, we can also customize a tour or a trek to suit your exact requirements and dates. In short, we will make every effort to get you on the trip you want, when you want. The dates for these following trips are ex Kathmandu, you have to arrive Kathmandu at least 2 days prior to each departure date. You can also join any of our trips from Lhasa. For a comprehensive trip dossier or any further information, please contact us. These are subject to change and depend on whether you join the trip in Kathmandu or China. If you are joining the trip in Kathmandu you will need a multiple entry visa for Nepal which can be obtained either from your nearest Nepalese consulate or on arrival in Nepal. If you are staying only 3 days in Nepal you are entitled to a free visa. Throughout your time in Tibet you will be accompanied by a knowledgeable Tibetan guide who will not only act as an interpreter but will also provide a valuable insight into the Tibetan way of life. Our all treks and Mt. Kailash tours are catered by our qualified and experienced crew from Nepal Loads are usually carried by Yaks. In Lhasa, accommodation will be at Dhood Gu/Jinbo Grand hotel (3 star) or similar standard hotel. They are renowned for their hospitality and warm Tibetan atmosphere and are perfectly situated in the centre of town just a few minutes walk from the Jokhang Temple and Barkor. Elsewhere along the route, accommodation will be in the best available hotels. After day 5 of the trip eating and sleeping will be at Tents. A typical day begins with a hot cup of tea brought to the tent at about 6 am, followed by a bowl of hot water for washing. After packing our bags and having a good breakfast, we set off on the morning's walk. All you need to carry is a small daypack containing a water bottle, camera, sun cream, hat, rain-jacket and a warm jumper, just in case. The porters or yaks will carry everything else for you. After walking for 3-4 hours we stop for lunch at around midday. The afternoon's walk is generally shorter and we arrive at camp in time for a nice cup of tea. The remainder of the afternoon can be spent exploring the nearby villages, doing a bit of washing or simply relaxing with a good book. Dinner is usually served between 6 and 7pm and after dinner, the evening is often spent playing cards or talking with the crew – and sometimes there will even be some singing and dancing before heading off to the tent for a well-earned sleep. The best time of year for treks and Mt. Kailash tour from April to the beginning of October. Our tours and treks are based on entry and exit from Kathmandu. However, you can also enter from parts of Mainland China, i.e. Beijing, Chengdu etc. All our trips, which begin by flying into Lhasa, can be joined from Kathmandu, Beijing, Hong Kong, Chengdu or Bangkok (via Chengdu). In the cities above you will be met at the airport and transferred to your hotel. You will then have he chance to see the sights before being transferred to the airport the next day for your flight to Lhasa. Additional accommodation in Kathmandu, Beijing, Hong Kong, Bangkok or Chengdu can be arranged, please ask us for more detail. Can you send you gear list and other relevant information once you decide to book.